Enjoy life in Mission Royale Adult Village! Home sits on a Premium Corner Lot and backs the Golf Course on the 6th tee. The open concept floor plan offers soaring ceilings, designer detail, and picturesque windows throughout. Kitchen has been upgraded w/ granite counter tops and provides an abundant amount of counter & storage space. NEW tankless hot water heater was installed this year along w/ New toilets, New garage cabinets, and NEW exterior paint. 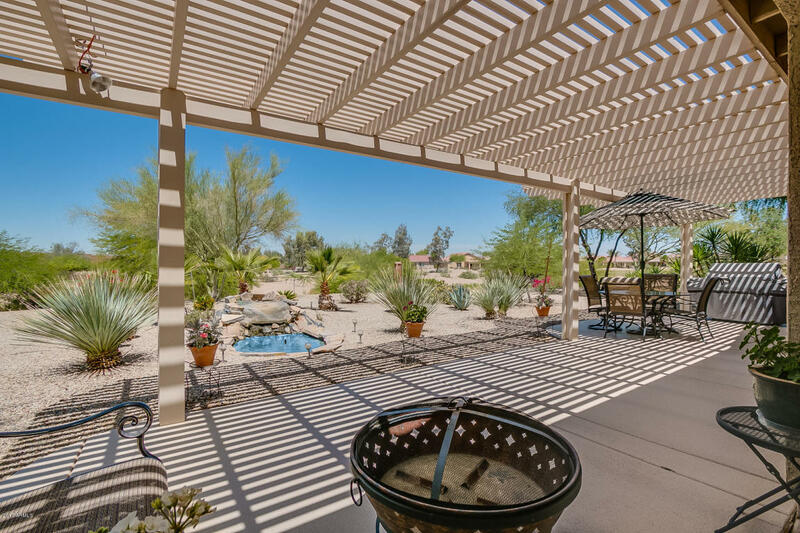 Backyard boasts an extended epoxy patio w/ pergola, incredible scenic views, and a relaxing pond. Mission Royal living provides a fitness center, billiards room, library, ballroom, two swimming pools, a spa, and tennis & pickleball courts. Don't forget about that Golf Course in your new backyard!